The August CPI report showed inflation to be a bit lower than expected (-0.2% vs. 0.0%), thanks mainly to falling energy prices. As the chart above shows, both total and core consumer price inflation are running a little under 2% per year, which is largely unremarkable. The bond market, however, is making some interesting adjustments these days: TIPS prices have fallen significantly, as inflation fears subside and the market adjusts to a somewhat improved outlook for economic growth. 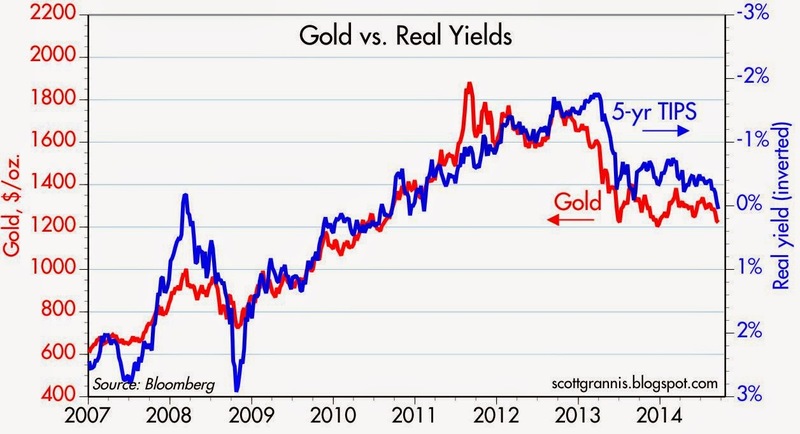 The above graph shows what I think are the two most important variables to watch these days: the real yield on 5-yr TIPS and the price of gold. 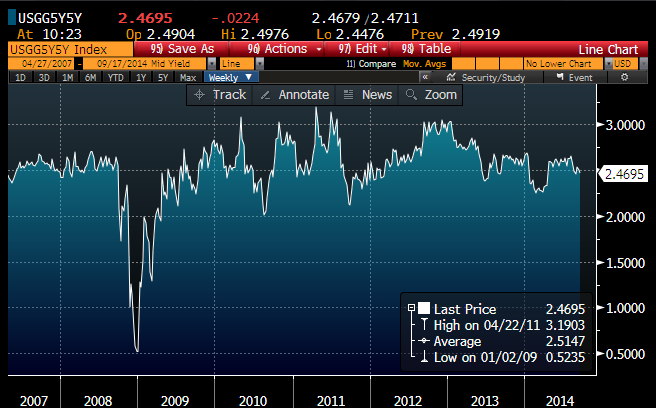 (The blue line is the inverse of the real yield on 5-yr TIPS, so it is a good proxy for their price.) The prices of both gold and TIPS have been under downward pressure in the past few years, with pressure intensifying of late: real yields on 5-yr TIPS have jumped by some 45 bps in just the last month, while gold prices have fallen over 7% in the past two months. As detailed here in a post one year ago, I think this reflects an important decline in the market's demand for safe assets, which is equivalent to an increase in the market's general confidence in the future, and equivalent to a decline in risk aversion. This is very important because the whole purpose of the Fed's Quantitative Easing programs, as I see it, has been to satisfy the world's demand for safe assets, not to stimulate the economy. In other words, QE was a response to the tremendous risk aversion which arose in the wake of the Great Recession. Risk aversion is now beginning to fade, so it is appropriate that the Fed should end its QE program. The FOMC announcement today confirms that QE3 will end next month, and the Fed will begin increasing short-term interest rates next year by raising the interest rate it pays on reserves. 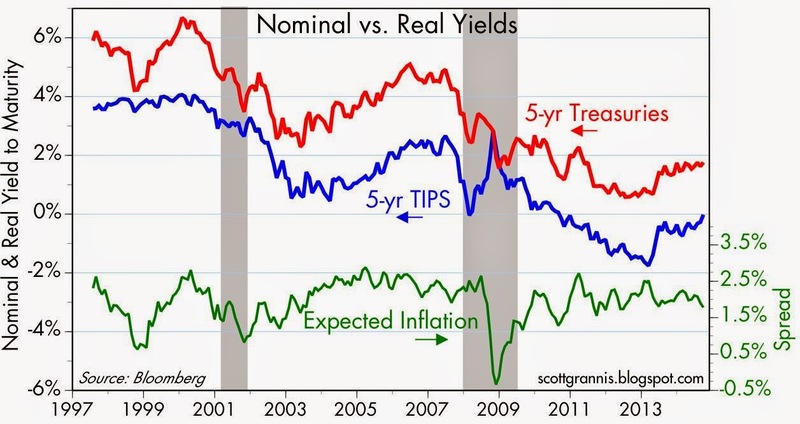 The rise in real yields on TIPS is also a sign that the market's outlook for economic growth is improving. 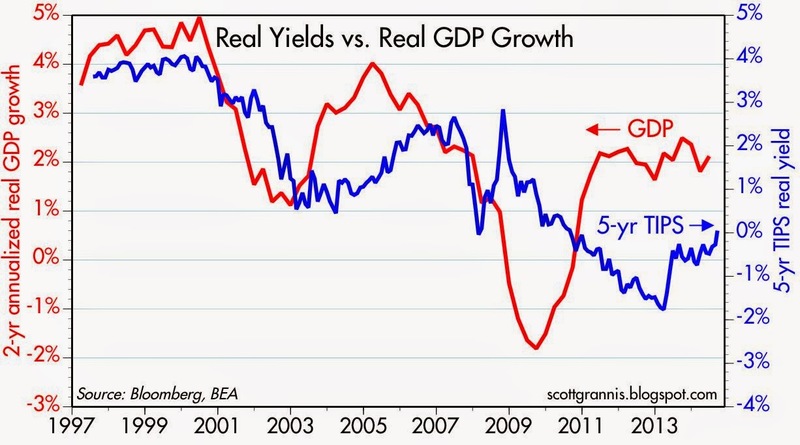 As the chart above shows, real yields tend to track the economy's growth potential over the years, which makes a lot of sense. TIPS are unique because they offer a guaranteed real rate of return. That risk-free real return should be somewhat less than the expected real growth of the economy, since that is fundamentally uncertain. But real yields have been unusually low for the past few years (e.g., real yields have been -0.5%, whereas real economic growth has been a little over 2%), which I've taken to be a sign that the market was very pessimistic about the outlook for growth. That's now beginning to change for the better, as real yields move higher. It's not that the market has turned optimistic, however; it's more accurate to say that the market now has become less pessimistic. The two charts above show the nominal and real yields on 5- and 10-yr TIPS, and the difference between those yields, which is the market's expected average rate of inflation over the next 5 and 10 years. The current expected rate of inflation over the next 5 years is about 1.8% per year, and the expected rate of inflation over the next 10 years is about 2.1%. This implies that the expected rate of inflation from 2020 to 2024 is about 2.5% (otherwise known as the 5-yr, 5-yr forward expected rate of inflation). This is not particularly scary, but it does suggest that the Fed can't afford to wait too long before tightening policy, since long-term inflation expectations are somewhat higher than the 2% the Fed now considers to be optimal. The chart above shows Bloomberg's calculation of the 5-yr, 5-yr forward expected rate of inflation. Expectations today are almost identical to what they have been on average over the past seven years. No sign of deflation, and no sign of unpleasantly high inflation either—almost a goldilocks outlook. But with the outlook for the economy improving on the margin, it doesn't make sense for the Fed to continue its ultra-accommodative monetary posture much longer. Given the muted reaction to today's FOMC's announcement that QE3 is almost finished and higher short-term rates are coming next year, it appears the market agrees. This is all good. The Fed and the bond market are responding appropriately to declining risk aversion and a somewhat improved economic outlook. There is no reason to fear the end of QE or the beginning of higher short-term interest rates. Of course, the Fed targets the PCE deflator, not the CPI. The Fed has been under-shooting its inflation target since 2007. The price in lost output is the enormous. I prefer the 2-3 percent inflation band of the Aussie Reserve Bank. Israel uses a 1-3 percent band. The Fed evidently regards the 2 percent target as an inviolable ceiling. Monetary asphyxiation is the result. There is no evidence to support the notion that the Fed has undershot its inflation target or that inflation has been so low as to cause a serious loss of economic output. Over the past 10 years the CPI has increased at an annualized rate of 2.3%. The PCE deflator has risen at an annualized rate of 2.0%. For the past 12 months, the CPI is up 1.7% and the PCE deflator is up 1.6%. There is nothing in these numbers that points to any sort of macroeconomic problem that might have been caused by the Fed. There is no reason to think that a higher rate of inflation would have resulted in a stronger economy. 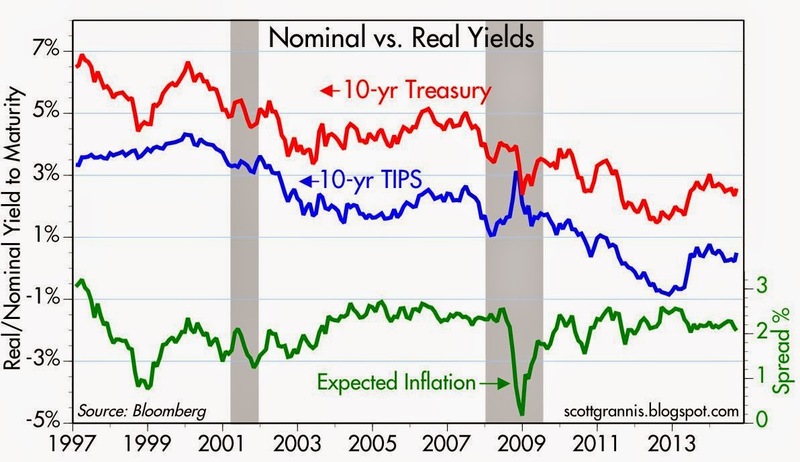 How are real yields calculated in the second graphic or are they simply the yield of 5 Yr TIP? From this, I understand real yields are the markets imperfect expectations of future growth rates. And I take it Tips become undervalued when the "true" future growth rate is greater then what the market expects. Jeff: TIPS are a special type of bond. The principal is adjusted for inflation, and the coupon (the real yield) is paid on the adjusted principal. So the return to the investment is equal to a real yield plus whatever inflation the CPI registers. The higher the real yield, the more attractive they become.